Hyundai has built a loyal customer base by offering practical transportation value. It should come as no surprise that their first entry in to the minivan market is a solid one. The Entourage and its sibling the Kia Sedona are built on a dedicated minivan platform with the size and power to compete with the class-leading Toyota Sienna and Honda Odyssey. Three trim levels are offered ranging from a well-equipped GLS entry model to the fully-loaded Limited. The Entourage offers virtually every feature found on the class-leading products at a competitive price point. The inclusion of standard stability control, side-curtain airbags and Hyundai's long warranty will help push the Entourage to the top of many shopping lists. 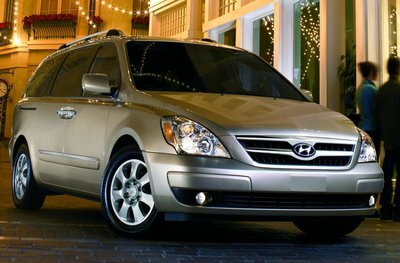 All-new Hyundai Entourage minivan is virtually identical related to the second-generation Kia Sedona. The Entourage is powered by a 242 hp V6 mated to a five-speed automatic. The Entourage has three rows of seating for up to 7. The third row seat folds flat in to the floor.